Andy Lee challenges Julio Cesar Chavez Jr for his WBC Middleweight title next month, and Sergio Martinez is waiting to pick apart the winner. Martinez has a contract that gives him a fight with whoever comes out of this match carrying the belt, and the WBC Diamond champion wants the fight in Argentina. Cesar Chavez Jr is the defending champion, and most have him as the favourite to win. His impressive sounding record of forty-five wins and his massive Mexican popularity mean that people expect a lot of him, but it would be a mistake to overlook Andy Lee. The Irishman has lost just once in his career, a 2008 defeat against Brian Vera. He has since avenged his defeat and has looked more and more impressive on the way to racking up a twenty right win record. I think Andy Lee will unseat Chavez Jr.
As well as the WBC world title, a fight with our pound-for-pound number three Sergio Martinez awaits Lee. Martinez has found himself a mega star in his home country of Argentina, and he'd like to place the fight there. It makes sense too; Martinez is much more popular in Argentina than Lee is in Britian or America. 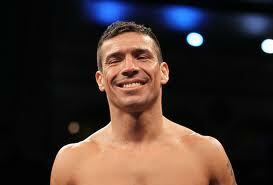 Wherever it happens and whoever he fights, it will be good to see Sergio back in the ring.